The Stop Online Piracy Act has generated a great deal of controversy over the past few months. The bill is so controversial in fact, a group of 83 engineers who helped create the Internet have issued an open letter (PDF). If that were not contentious enough, top tech executives have also issued their own, albeit it more succinct, open letter conveying a similar message. "If enacted, either of these bills will create an environment of tremendous fear and uncertainty for technological innovation, and seriously harm the credibility of the United States in its role as a steward of key Internet infrastructure. Regardless of recent amendments to SOPA, both bills will risk fragmenting the Internet’s global domain name system (DNS) and have other capricious technical consequences. In exchange for this, such legislation would engender censorship that will simultaneously be circumvented by deliberate infringers while hampering innocent parties’ right and ability to communicate and express themselves online. All censorship schemes impact speech beyond the category they were intended to restrict, but these bills are particularly egregious in that regard because they cause entire domains to vanish from the Web, not just infringing pages or files. Worse, an incredible range of useful, law-abiding sites can be blacklisted under these proposals. In fact, it seems that this has already begun to happen under the nascent DHS/ICE seizures program." The bill aims to strengthen the role of government, law enforcement and private actors in order to better control the sale of counterfeit merchandise, the theft or infringement of intellectual property and other criminal (and possibly non-criminal) activities. The bill does this by giving these agencies unprecedented power to block websites, legally demand compliance by filtering certain types of content on the web and allows agencies (including private companies) to pull funding from undesirable websites by cutting off advertisers without due process. Proponents of the bill believe it provides the necessary tools to finally combat the dark underbelly of the web. Detractors see the bill as a dangerous mix of "draconian" and "vague". As a result, a number of technology luminaries, legal scholars and a many Internet users see the bill as a threat to the Internet. While the bill earnestly aims to put a damper on illegal materials found on the web, it broadens discretionary powers of agencies in scary ways -- ways that technology companies, law professors and founding engineers of the Internet disagree with entirely. This is terrifying to watch. It would be amusing — there’s nothing like people who did not grow up with the Internet attempting to ask questions about technology very slowly and stumbling over words like “server” and “service” when you want an easy laugh. Except that this time, the joke’s on us." 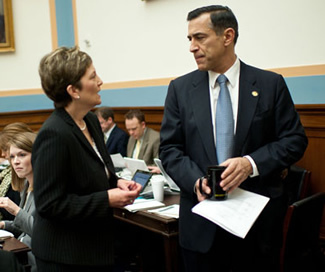 Congressman Darrell Issa (R, California), a self-proclaimed "nerd", has provided everyone a way to watch the debate live as it unfolds. Check out KeepTheWebOpen. Additionally, visitors can view and make suggestions or comments on each of the provisions found in the current draft. SOPA has not passed yet, but Congress is currently working on "markups", a process where recommendations are made before the bill is considered on the House floor.